Scholastic chess is booming in Hawaii! Generally, there are about 10 major scholastic tournaments per year. The State Scholastic Championships every year draws over 100 players from all over the state, Kindergartners to Seniors in High School! If you are a scholastic player looking to play in one of our tournaments or a parent/teacher looking to get involved, check out our current tournament schedule for upcoming tournaments. We have recently launched the EZ CheckmateAutism Chess Scholarship, a reat opportunity for children with autism or Asperger’s. If accepted, a Hawaii child will be able to attend a chess camp for free! We are extremely proud of our scholastic players, some of whom have won national titles. 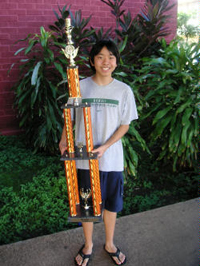 For example, in 2009, 9 Hawaii players competed in the SuperNationals in Tennessee, and all 9 took home trophies! Ford Nakagawa tied for 1st and became the National Co-Champion in the K-5 section!